Through our partnership with Unit4 Business Software, we are able to integrate our logistic and their financial solutions to provide a unique multi-level solution specific to your enterprise. The financial and resource planning tools provided by Unit4 work alongside the Humanitarian Enterprise Logistics Manager (HELM) to create a flexible module to aid in your business’ goals. With this added convenience, your enterprise is free to work harder towards it’s most important mission of helping others. Through our partnership with Unit4, you can review your complete financial health at any time and streamline administrative processes with a vast array of tools to provide the greatest efficiency. By utilizing HELM alongside the business tools provided by Unit4, you can quickly respond to unexpected scenarios with real-time analytics and adapt to the ever-changing humanitarian environment in the most effective manner. Keeping up with your company’s finances is an integral part of any enterprise, but this is especially true in the humanitarian sector. Donors want to see where there money is going and be sure it’s being utilized in the best possible manner. 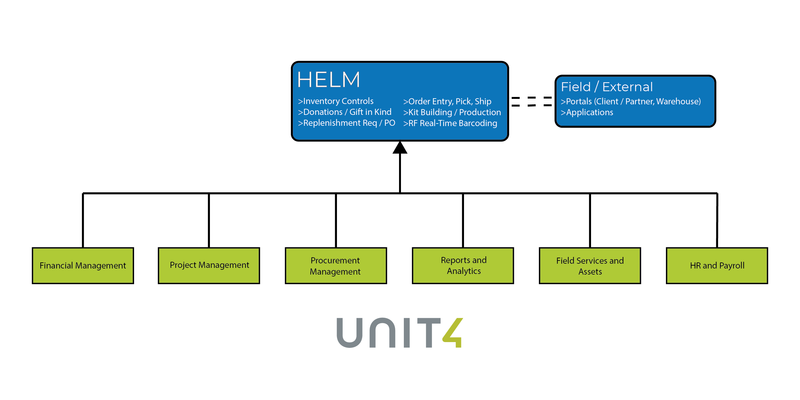 When using HELM in conjunction with Unit4, it’s easy to visualize all of your intakes and expenditures related to a project so you can report back to your donors efficiently and conveniently. The ERP is meant to expand HELM’s framework to include all the financial tools necessary to create a unique logistic-financial solution that’s capable of addressing any challenge in the humanitarian aid and disaster relief sectors.